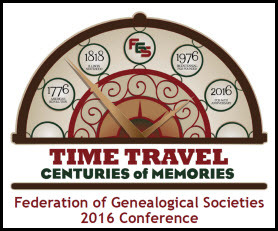 It’s Society Day at the 40th annual conference of the Federation of Genealogical Societies in Springfield, Illinois. A full day of lectures, presentations, workshops and more, aimed towards and focused on the needs of all those hundreds of people who keep the lights on and the wheels spinning in all of the genealogical groups that you and The Legal Genealogist belong to and benefit from. Can we all take a minute, right now, to say thanks to those folks? Serving as an officer or a trustee or a program chair or a committee member of a genealogical society is a volunteer unpaid thankless position. It has a lot of a headaches, and not a lot of payback. Somebody is always unhappy with what you’re doing. Somebody is always saying no to everything you want to try. Somebody is always holding back when it’s time to move forward. And somebody is always convinced he or she could do it better — but isn’t stepping up or volunteering to do it. And in spite of those headaches, somebody is always there to put out the cookies and the coffee. Somebody is always there to set up the chairs before the meeting, and put them away afterwards. Somebody is always there to write the blog post, set up the booth, put the banner up, sell the books and pins, hand out the ribbons. Somebody is always there, sitting through the endless hours of meetings to ensure that what we see, as members and attendees, is smooth and helpful to us. Without those somebodies… without those volunteers… so much of what we have available to us as genealogists just wouldn’t happen. And without societies all of our genealogical lives would be so much poorer. So hats off to the society volunteers!